Images of the wolf through history have been considered somewhat fearful. The wolf is often presented as being ferocious and ravenous. The canine creature is often shown to be willing to eat anything it can sink its teeth into. Such images, while common, are mostly rooted in melodrama as opposed to the serious study of animals. Wolves are not vicious carnivores. They eat a specific diet that is common to many forest predators. Basically, a wolf eats meat and enough of it to survive. Wolves do hunt in packs and will work together to take down a large animal. A large animal, such as a moose, elk, or water buffalo, can offer enough raw meat for the pack to survive. Since wolves must conserve energy on their hunts, they do not go after the strongest beast in a herd. The truth is, they typically go after the very young, the very old, the sick, the slow, and the weak. Simply put, this is the best way for the wolf to increase its chances of actually getting a kill, eating, and surviving. The other incorrect assumption about what wolves eat would be the belief that wolves only hunt big game animals. If this were the case, wolves would have since become extinct a long time ago. There are only so many opportunities for the wolves to successfully hunt big game and not all of the attacks on a herd are successful ones. Wolves can eat other prey in order to survive and, sometimes, the prey is very small game. Rabbits, squirrels, and other such forest creatures are frequently going to be meals for wolves. Wolves may even eat fish at times. If a wolf eats a salmon, for example, that is stuck swimming upstream, a wolf may make a meal out of it. Wolves might even eat very small prey. Mice and grasshoppers are staples of a wolf's diet. A wolf might even forage for worms if need be. Food is not always easy to come by for a predator, which is why a wolf must accept whatever food source it can find. A wolf might even be willing to eat edible berries. This might seem strange for a carnivore, but in the wild, a predator is not going to be too selective about what it eats. Another fact about the eating habits of wolves is that they are willing to eat carrion. 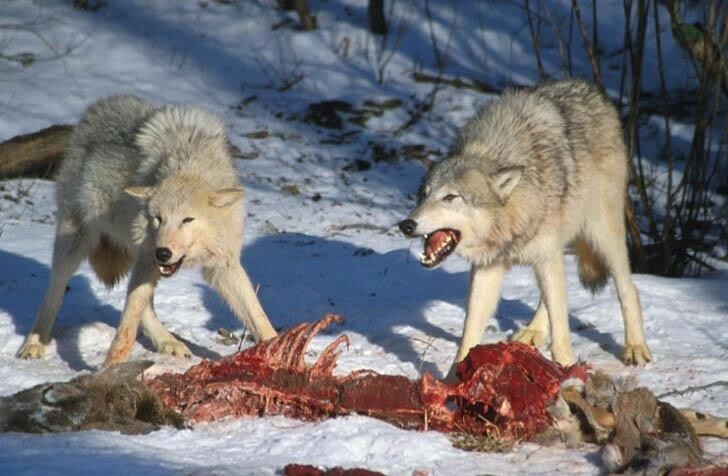 Wolves are not scavengers, but they might have to settle for dead meat in some cases. If the wolf is old, the ability to hunt effectively may be diminished. As a result, carrion becomes a more attractive option.